It is not surprising that these days – as tectonic shifts materialize within the system of international relations, formerly uncontested global authorities like the UN and the OSCE are sinking into serious crises, and the whole architecture of the international law is crumbling - the Shanghai Cooperation Organization (SCO), a regional group whose potential is seldom called into question, is passing through a phase of protracted identity searches that threatens to turn chronic. While China and Russia, the two SCO heavyweights with their original foreign-policy programs, largely define the organization's integral agenda, the group continues to lack an overarching concept, and divisions persist among the SCO members over the objectives behind their alliance. The multilateral part of the SCO internal mechanics appears particularly fragile, plus the interactions between SCO and other global actors obviously await a series of bold adjustments. It is clear at the moment that many of the unbridged gaps between SCO members are actually widening as the post-Soviet Central Asia is being ripped apart under conflicting external influences. 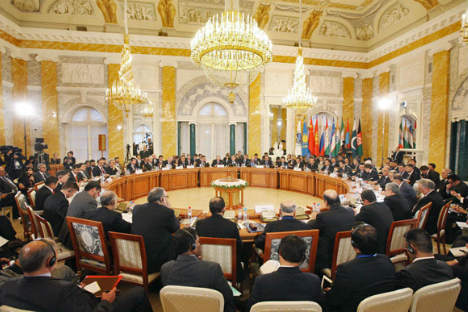 Neither the political and military, nor the economic potentials of the cooperation in the SCO framework have been fully unlocked so far, and the assessment is fair that bilateral activities such as massive Chinese investments in Tajikistan's infrastructures or the energy cooperation between Russia and Kazakhstan actually constitute the prevalent form of transactions under the nominally multilateral SCO umbrella. Generally, the key function of the SCO should be to achieve synchronism among its members on the basis of the values and principles which they, in concert, suggest as the optimal foundations of the new world order. In practice, the SCO should focus on regional stability which can only be propped up by a combination of deep economic integration and sound collective security arrangements. The widening of the SCO, which is a prerequisite to its development, will continue to stall unless the group convincingly spells out its mission and conceptual basics. As of today, the plan to which the organization subscribed – to go beyond reacting to external pressures and to emerge as a player exerting a formative influence of the geopolitical and geoeconomic space around it – mostly remains on paper. • The group's mechanisms of integration in the spheres of politics and security should serve as solid guarantees of shared economic success. • The SCO economies are in various regards complementary and structurally open to efficient division of labor. • The SCO as a whole sits on exceptional energy reserves. • The SCO countries have considerable R&D and industrial capacities along with skilled and relatively cheap labor. The bigger economies – China and Russia – as well as their modestly proportioned Central Asian peers similarly stand to benefit from membership in the SCO ensemble by intelligently relaying resources and reserves. For example, the Russian and Kazakh oil and gas sectors together with the Tajik and Kyrgyz hydropower can supply China's energy needs and, at the same time, draw confidence from being linked to the ample and steadily growing Chinese energy market. The security and economic stability of Russia and China will increasingly depend on the pace of socioeconomic progress in the neighboring countries and regions. Considering the territories and population sizes of the SCO members, the group simply has to feel being a candidate for a definitive role in building the present-day world order. Russia and China are not to any considerable extent economic rivals. Neither of the two needs or has a chance to dominate the other economically, meaning that both should have no problems reaching compromises and therefore can play duo, putting to work their respective competitive edges. Overall, the SCO offers to its members excellent terms for cooperation, in part because neither of them is interested in seeing others clash. Few regional groupings compare to the SCO in terms of the internal availability of the full production and consumption cycle. The admission of Iran, India, Pakistan, and Mongolia as observers should make the SCO even more self-sufficient. From this standpoint, Iran as a country with giant energy reserves and handy transit infrastructures merits a special invitation. Having Iran built into it would make the SCO a holder of the lion's share of the Eurasian energy reserves, with the political perks automatically added to the economic balance sheet. The lingering Afghan crisis – and Washington's attempts to perpetuate the US military presence in the country, to spread it from Afghanistan to Central Asia, to cause the conflict to spill over to Pakistan, and to eventually undermine Iran – altogether impose a heavy burden on the international agenda. The SCO keenly needs an independent Afghan settlement plan comprising a blueprint for the country's domestic reconciliation, a list of shared priorities vis-a-vis Afghanistan, and a set of realistic proposals for the Afghan economic reconstruction. A healthy Afghan economy is what it takes to achieve progress in warding off the threats of terrorism and drug trafficking currently related to Afghanistan. The US military presence in Afghanistan and Central Asia bears an increasingly corrosive effect on wider Eurasian stability. Rather than removing the threats it pledged to, Washington generated new ones stemming from the escalation of geopolitical rivalries in Eurasia. The US influence on the domestic policies of Central Asian republics sends shock waves across the countries and the region as a whole. Neither being a military bloc nor dreaming of becoming one, the SCO does have to attend to it that its resolutions are not ignored internationally. The declaration of the SCO July, 2005 Astana summit stated lucidly that, given the completion of the active phase of the operation in Afghanistan, the Western coalition countries which had been admitted to the territories and infrastructures of the SCO members to carry out the offensive were to finally roll out a deadline for the lease. The SCO August 16, 2007 Bishkek summit declaration further stressed that Central Asia's security and stability would be maintained solely by the region's countries in the framework of its existing regional groups. Up to date, Russia is the only country to make at least some efforts to define the contours of the Central Asian security architecture after the expected 2014 relocations of the US forces in and outside of Afghanistan. The intrigue around the lease to the US of the Manas air base sited in the proximity of Bishkek provides a vivid example of the lack of coherent response from the SCO to the pertinent range of problems – the impression is that Russia is the only country that genuinely feels concerned, while China prefers to wisely watch the round of arm-wrestling between Moscow and Washington from a distance, Kazakhstan and Uzbekistan stay completely unperturbed, and Tajikistan made hosting foreign military infrastructures its ordinary gamble. From a wider perspective, the SCO zone of responsibility can and should additionally extend over Afghanistan, South Asia, and the South Caucasus, but so far the group has been known to implement a fairly narrow-minded model of its own development, spontaneously building, with the help of the Collective Security Treaty Organization, a kind of a system of regional balance with NATO in Central Asia. The transformation of the SCO into a regional security organization open to new partners – but not into a military-political bloc – could prove a more productive strategy. Ideally, security in Central Asia could be ensured via the cooperation between countries whose strategic interests are harmonizable and whose political involvement or, occasionally military presence in neighboring republics could be seen as a traditional phenomenon in Northern and Central Eurasia. The SCO has the basic capabilities to parlay the model into reality. The current geographic configuration of the SCO, however, leaves much to be desired. Due to the fragmentary character of the group's geopolitical space, it is unable to fully assume responsibility even for the territories of its member and observer countries, least to come up with a more ambitious agenda. The zones geopolitically outside of the SCO orbit are the territories of the observer countries plus Turkmenistan, Azerbaijan, Armenia, Turkey, Iraq, South East Asia's mainland, and, of course, Afghanistan and Turkey. There is no such thing as vacuum in geopolitics, and if the SCO honestly intends to establish itself as a viable global alternative, the Eurasian heartland should be led to conform to a unified set of international laws and a common code of conduct. The weakness of the UN and the OSCE must be read by the region's countries as an opportunity to take charge and to regain control. The issue of the territorial span is not the only bump down the SCO road to greater unity and clarity of strategic vision. Russia's and China's input to the SCO conceptual and procedural foundations is of great importance, but so are the contributions from other member countries. Foreign policy swings written off as manifestations of a pluralistic approach – e.g. Tajikistan's 2007-2009 clumsy moves to align itself with Russia, the US, and Iran in a bundle – would in the long run prove self-defeating for those whose behavior follows the bizarre oscillating patterns. At the moment virtually every small country in Eurasia, from Kazakhstan to Georgia, is more of a pawn than of a player on the chessboard of global politics and has to adapt to the strategies pursued by more powerful trendsetters. It must be bluntly taken into account that only two countries – Russia and China – can be regarded as such in the post-Soviet Central Asia.